I have a 25ft making 1986. It currently has a 225 Mercury EFI 2014 . Unreliable and doesn't have enough power. I Have always always Suzuki's. I plan on buying a Suzuki. What is the recommended engine size for this boat and what is the largest. I know Suzuki's are not biuld for speed but would like to have the biggest I can get. 300hp to much? The largest engine of the day in 1986 was the 3.6 liter V8 300hp OMC and Mercury 3.4 liter V6 300hp. I have seen both on 25ft Makos. The issue will be weight. Any 350hp would be too heavy but the new Mercury, Evinrude, Suzuki or Yamaha 300hp should be great. I had a 1984 254 Mako, had twin 225 ox66 and twin 150 optis on a bracket. The 225's were heavy but really didn't matter, but it would run in the 60's. The 150's were around 48mph but the boat rode perfect. Now my buddy owns it and has a single 2015 Yamaha 300 4.2l and it runs great around the same speed as the twin 150's. My other buddy has the same Mako with a 350 v8 Yamaha and it runs perfect, it's around a 52mph boat. Anything more than about 800lbs on the transom and you'll notice the weight. If it was me, I'd just go twin 350 verados cause the weight doesn't matter to me, just drive the boat and go fishing. They could come with twin v6 two strokes from the factory, so (as I recall) about 800 pounds back there. It's funny a modern single is comparable to older twins, but at least you have the factory design for the weight of a modern 350. The numbers I have seen with a single 300 look really good to me, though; top end just under 50 and good efficiency. That 300 sounds like a great motor for that boat. Ya have to be a tad careful asking for advice on a 25 Mako. There were a few different 25's over the years. The 300 is the perfect engine when paired with a flotation bracket. Im sure it would be very good mounted directly as well. I wanna say my grandfather said it came originally with twin 2 stroke Johnson on it. I just replaced the 150 gallon gas tank, all new electrical wiring. I don't plan on putting a bracket but 300 Suzuki if top end is more than 45 I'll be happy with that. I'm looking for fuel efficiency and decent top end. I'm not going to put a bracket on it although it would be nice. If I put a bracket the I would beef up for twin 200. But at that point I would just buy a boat built for speed like regulator, contender, capehorn. And it is a 254 1986 mako. So a 300hp Suzuki it is. 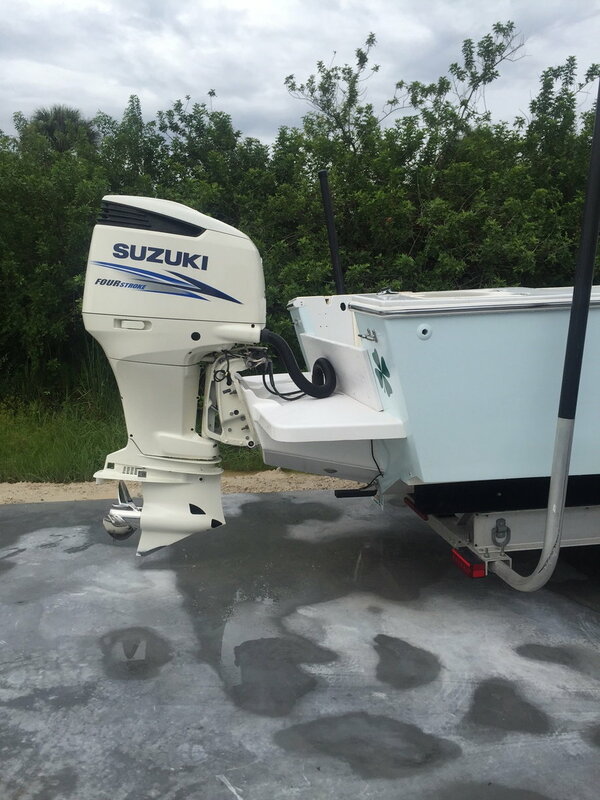 I've had Suzuki on all my boats and they have been wonderful. There's a dealer and machanic close to where I dock my boat. I'm looking for best efficiency, and reliable but don't want to be the slowest boat out there. This boat is mainly for my jersey shore wreck fishing and Striper season along the coast,. I would like to be able to have that distance to go where I need to go to find the fish fastest and most efficient way. caper and v12mac like this. you are going to love it! I can get almost 3 mpg at 29-30 mph and still get 2 mpg at 40 mph. Top speed is right at 46 mph on my boat with a full tower although very light I did see 50 once with the 20" pitch. the 18.5"pitch will probably be your best overall and if it over revs add some cup to make it even better. Sounds like a 300 Suzuki would be what you are looking for. You should see close to 50mph and up to 3mpg. I have a 250 zuke on my 25 Whitewater and get about 47mph on top, and have seen 3mpg light. But I have never seen less than 2mpg, no matter what load or conditions.